For the past month, the international community has been on edge expecting a fourth North Korean nuclear test, which the South Korean Foreign Minister recently characterized as a “game changer.” The high level of anxiety has been the result of a stream of warnings emanating largely from the ROK Ministry of Defense and parroted by various news media, predicting a test would occur during President Barack Obama’s visit to South Korea. Of course, that visit came and went without a blast and warnings since then from Seoul as well as leaks to the press have also come up short. 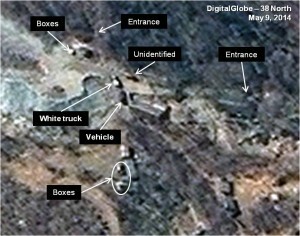 Interested observers would be justified in asking themselves: “What is going on here?” It is worth noting that since early April there has been an increased level of activity at the Punggye-ri Nuclear Test Site visible in commercial satellite imagery used by non-government analysts, specifically in the South Portal area where it is suspected there are two completed test tunnels. There has been stepped up movements of vehicles and crates, and boxes have appeared and disappeared near tunnel entrances, all consistent with possible test preparations. New commercial satellite imagery from May 9, 2014 essentially shows more of the same. There is activity at both tunnel entrances in the South Portal area, although less than in previous imagery. There are two vehicles in front of the eastern tunnel entrance: one small truck with a white body and what appears to be a military truck on the bridge spanning a nearby creek. Also present are two white crates or boxes in the same location as seen in imagery from May 1 near the western tunnel entrance as well as a small vehicle directly across the road. There are more crates and one vehicle visible across the bridge. Figure 1. Activity continues at the South Portal tunnel entrances. 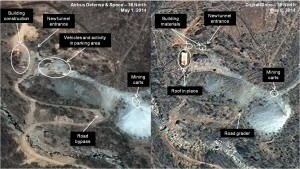 The May 9 imagery indicates activity in other areas at the site as well, but none seems to show a test is “imminent.” As noted in previous 38 North analyses, activity in the West Portal area includes continued excavation of a new tunnel that has been ongoing since May 2013 (the North Koreans seem to now be using an old dump site for spoil), work to widen and level a portion of a road leading to the new tunnel’s portal, the continued construction of a new support building which now has a wooden roof and the appearance of a new logging area and a further skid trail to the east of the other three identified in May 1 imagery. There is even a new rectangular area—possibly a garden—inside the fence to the north of the tunnel excavation. In short, the imagery shows activities, even the most mundane, that you would not expect if a test were imminent. Figure 2. Excavation and construction continue at the West Portal area. Figure 3. New logging skid trail north of the West Portal. The same is true for the Main Support Area, which in the past has been a key facility used to prepare for a nuclear detonation. If a test were imminent, there would be a high level of activity, special vans used for secure communications and other vehicles spotted in the past that were unidentified but may have been somehow related to the nuclear device. However, in the May 9 imagery, activities in this area seem consistent with those needed for routine maintenance. There are some vans present, a number of crates appear throughout the area and piles of lumber are visible near work underway on the roof of one building. Figure 4. Activity continues at the Main Support Area. Is a Test Imminent or Not? Based on available evidence (and that phrase should be in bold letters since all we have are commercial satellite images every few days at best) as well as having spent the past month listening to pronouncements about the likelihood of a test occurring, it appears that a nuclear test is not imminent. Indeed, given previous North Korean practices, one possible conclusion is that if the North is planning a test, it may still be weeks away. First, the North Koreans may be planning another test but never intended to conduct one this soon. 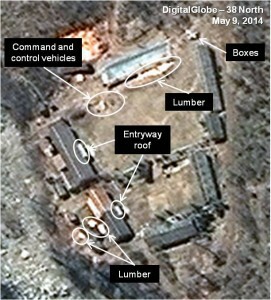 Leaving statements aside about the North’s plan to conduct a “new form” of test, activity on the ground at Punggye-ri may have been more related to other purposes, for example, maintenance after the end of winter, general upgrading of facilities, or activities other than test preparation. Alternatively, the North Koreans may have decided to play the public attention generated by predictions of an imminent test for all it was worth. Given recent US-ROK joint exercises and the deterioration of relations with the Park Geun-hye administration, hyping the threat of an imminent test served an important objective for Pyongyang, namely, to never appear weak, and stay in the news headlines. Third, the North Koreans may possibly have been planning an imminent fourth nuclear test but decided not to do it at the last minute. It is likely they didn’t care about pronouncements by the United States and South Korea urging them not to test. But it may be that behind the scene efforts by Beijing could have dissuaded the North to hold off. Of course we may never know if any of these explanations is correct. Another possibility is that neither governments nor non-governmental organizations have a particularly good track record predicting the North’s behavior (although 38 North’s record is better than most) because of analytical shortcomings. Aside from the inherent problems discerning what is happening inside test tunnels and the shortcomings of “crate-ology,” given the small number of North Korean tests conducted thus far, we simply do not have enough experience to create a reliable predictive model. 38 North has tried to develop a set of indicators that might show preparations for a test. But that still remains a working hypothesis rather than a definitive method of prediction since, at the end of the day, tests only occur after a political decision by the North Korean leadership. The limits of analysis are perhaps best demonstrated by the case of the ubiquitous “tarps” at the North Korean test tunnel entrances. These have been cited on a number of occasions over the past month, most recently in a CNN report quoting an unnamed Pentagon official, as proof, now more than a week ago, that a test may be imminent. The theory is that these tarps appear when the North Koreans want to hide what is going on inside a test tunnel from the spying eyes of photographic satellites. 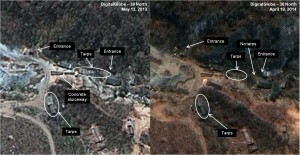 This makes a certain amount of sense since camouflage was present at the two tunnels used in the 2009 and 2013 North Korean detonations. However, a closer look at older satellite imagery of the South Portal area (where it is suspected a forth test will take place) indicates that, in fact, tarps have been present several times even when tests were not believed imminent. One possible explanation is that they were intended to protect mining carts carrying excavated spoil from overhanging trees and snow. That means what some analysts have been citing as the indicator of an imminent test may not be an indicator of anything at all. 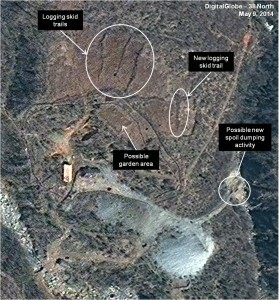 It may indicate that a test could be imminent—as in the 2009 and 2013 tests in the West Portal area—or it may indicate that there are ongoing routine activities—as in the 2013 image of the southern portal area. Figure 5. Tarps have been seen regularly around the South Portal tunnel entrances. Of course, given our limited amount of information, the North Koreans could test tomorrow, proving that indeed a blast was imminent. But after a month of crying wolf, it appears the odds-on favorite now is that a test is not imminent and in fact, may be some days, weeks or even months off. Pyongyang is certainly planning more tests; we know that if only because of the tunneling activities at the Punggye-ri facility. Moreover, it is entirely likely that the North is not only planning but will conduct more tests in the future. Leaving aside all the political reasons for testing, such as demonstrating military strength, Pyongyang is currently being driven by one important imperative: its new persona as small, emerging nuclear power. That means developing more and better nuclear weapons, along with the missiles to deliver them. That means more future nuclear tests.